Video and Toy Review: Toy Story 4 Forky Action Figures by Thinkway Toys Which One Should You Buy? Which Forky should I get? I have been asking myself this for two months! I ended up buying two different Forky figures by Thinkway Toys. 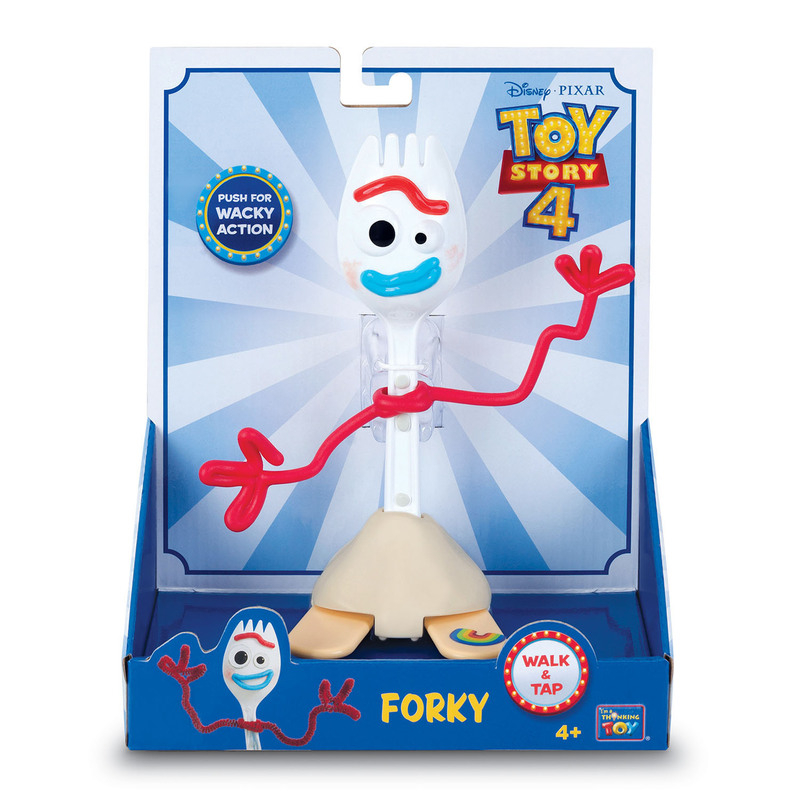 Free Wheeling Talking Forky is $25.99, and Walk and Tap Forky is $13.99. They are both very different, but do you really need two Forky action figures? You can take a closer look at the two Forky action figures and watch our unboxing video, or read on! You should check out our video only because you’re going to want to hear some wacky Forky sayings! 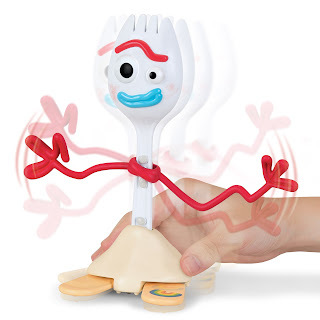 Toy Story 4 FORKY Free Wheeling Talking Action Figure $27.99 With the press of a button, you can hear some awesome spoilers said by Forky. He gives you a closer look into his neurotic mind, and then you get a glimpse of a little spork coming of age. Isn’t it wonderful that Disney Pixar has given life to the mundane item on the planet? I love it! This is why Forky is already such a beloved character for Toy Story 4. We have all made our own “toy” when we were kids. My son made a whole family out of play doh for his favorite show Big City Greens (I haven’t had the hard to throw them away even though they’re all crumbly and gross). Back to the action figure, Forky can speak with the press of a button and the help of one AAA battery. When you move him, he has wheels to to glide. His arms move just be rocking back and forth, and they are somewhat poseable. There is no real mechanism that coincides with the wheels at the bottom. His eyes are googly and they move just like Forky. His expression is a happy one so I would say this is Forky who has already accepted his fate as Bonnie’s toy. All that being said, he has a lot of capabilities. The price seems to be right, although, I think it would have been better at $19.99, that’s just me. Toy Story 4 Walk and Tap FORKY is $13.99 at Walmart and for ages four and up. Walk and Tap Forky is on the cheaper end, but it has its perks! For real pretend play or for recreating key movie scenes during playtime, Walk and Tap Forky may be the Forky for you. He has a funny Weekend at Bernie’s style smirk on his face. His eyes are not googly eyes, but they don’t move, sadly. 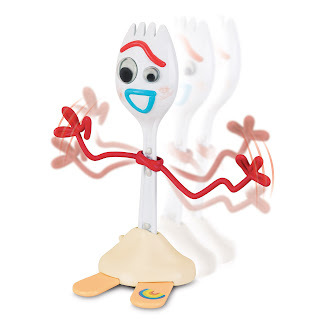 His arms coincide with the mechanism of the wheels, so when you move him he wobbles back and forth creating the signature Forky the spork gait. Forky cannot walk properly due to his massive popsicle feet and lower play-doh torso. When you move Walk and Tap Forky, his little popsicle feet ta in succession, and it is just the cutest thing ever. I wish that his eyes did move - that would have been the best addition to this figure. Otherwise, I think the price is right, and his features are fun for kids! During pretend play, do you need a doll that talks? Some may disagree, and that may actually hinder the imaginative process. I found both of my children gravitating towards Walk and Tap Forky. I would prefer Wheeling Talking Forky, because I love his phrases, and kooky hums - it’s like all of Tony Hale’s character personas got into a car together and started talking at the same time over loud music. I love it. Overall, for a child, I would definitely go with Walk and Tap Forky, it’s the best bang for your buck! Kids will love the way he moves, and parents will love the price. What do you think? Did I make the right choice? I already own both, so it’s easy for me to say. What do you think? Let me know in the comments below! 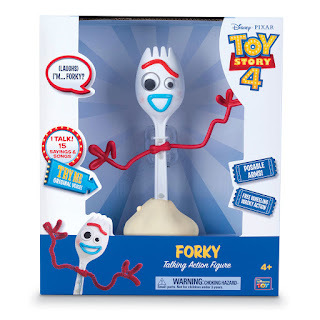 Labels: action figures, forky, Talking Forky, Tony Hale, Too Many Toy Story 4 Toys, Toy Advice, toy story 4, Walk and Tap Forky, Which Toy Story 4 Toy Should I Buy? 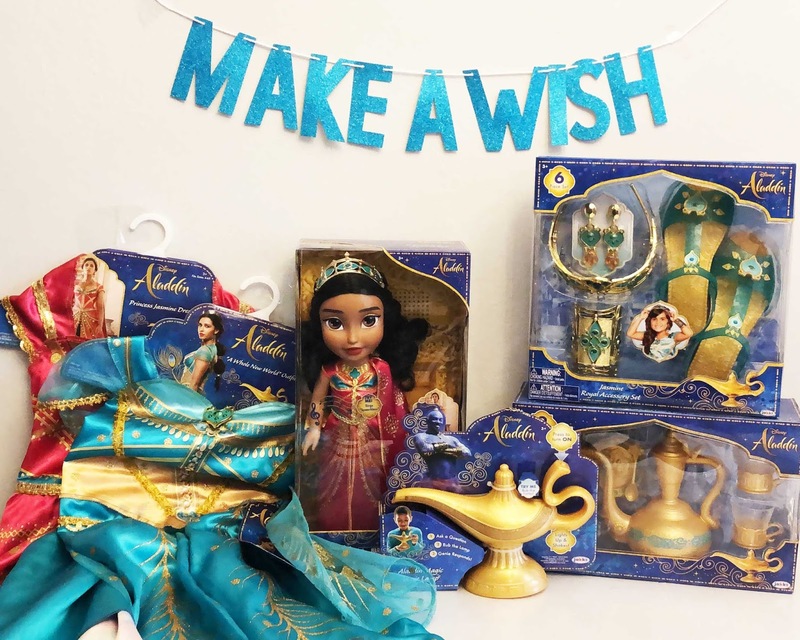 We’re taking a first look at the brand new Aladdin toys line produced by JAKKS Pacific in preparation for Guy Ritchie’s Live Action version of Disney’s 1992 Aladdin. Read on, it’s going to be good! Do you trust me? Read below, and watch the full unboxing video here. 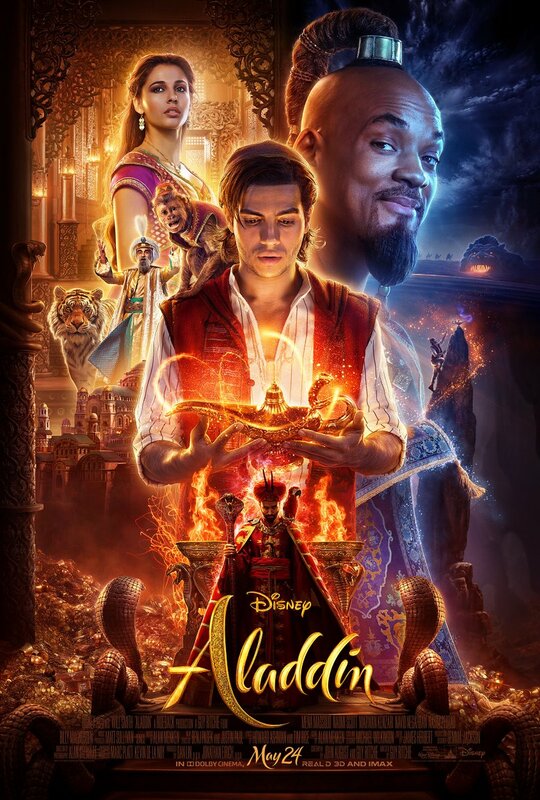 Just like a magic carpet ride, the soaring, free-wheeling rollercoaster that is the upcoming Aladdin movie, has kept Aladdin fans on the edge of their elephant-shaped thrones. 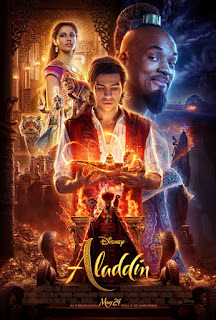 The last Aladdin trailer, however, gave this 90’s kid an Abu styled sigh of relief! The live action Aladdin sincerely has the heart, the comedy, and action that the original Disney movie had, and I can’t wait to watch it with my own street rats, I mean, my sons. With every big movie release, there is the release of toys and JAKKS-Pacific has what you need starting today at major retailers like Target, Walmart, and Amazon — all for kiddos aged three and up. 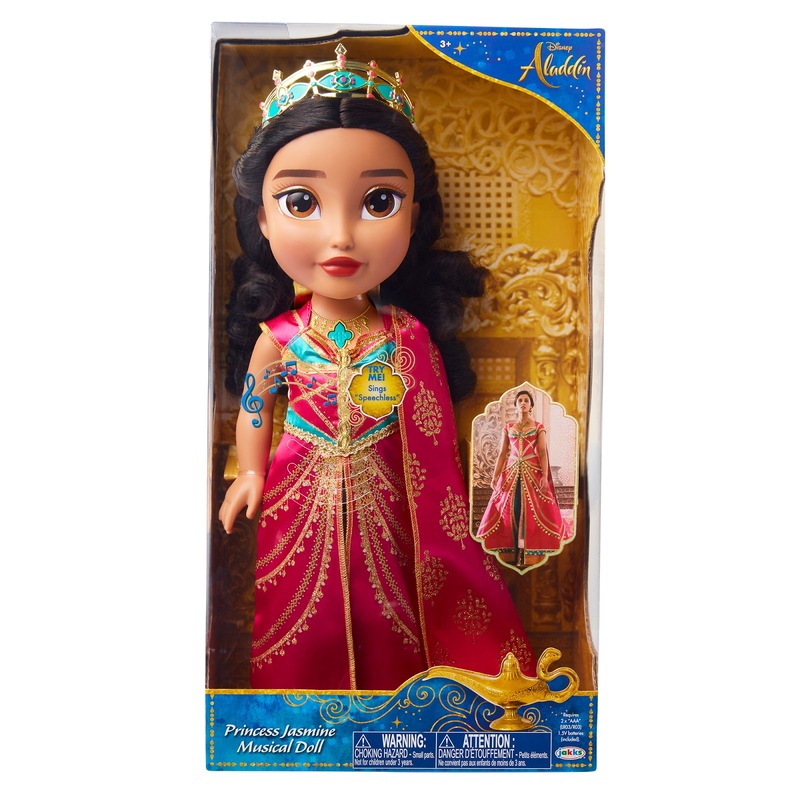 JAKKS-Pacific’s line features a collection of toys that highlights whimsical movie moments and will pull at the heartstrings of parents. Pretend to play toys and dress-up clothes and accessories will give playtime magical notes of creativity and storytelling. 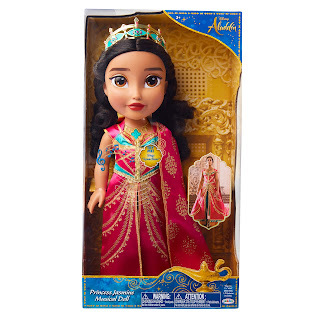 Princess Jasmine Musical Doll is inspired by Princess Jasmine’s pivotal movie moment when she sings the song, “Speechless,” which is supposed to leave the viewers speechless as well. The 15" doll embodies this iconic scene from head to toe, and it includes a tiara, intricately designed true to film dress and shoes. The doll is stunning! 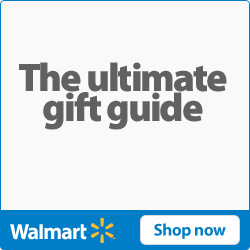 Swoop her up in your magical shopping cart for $29.99 at Target, Walmart, Amazon, and other major retailers. You ain't never had a toy like this! Well, you may have a while ago. 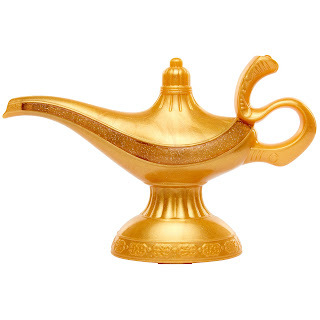 Newly redesigned for the live-action Disney’s Aladdin is the Magic Genie Lamp. 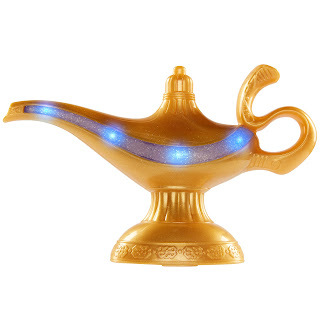 JAKKS-Pacific’s original Magic Genie lamp was more child-like then, whereas the newly designed Genie lamp has more than movie-quality elements, and really looks like it was found at the Cave of Wonders. Ask the Genie lamp a question, then rub the lamp, and watch and feel the lamp come to life! The shaking element really adds to the creative play, and the responses will give your kiddos lots of giggles with funny phrases. Hit the lights to watch it light up! 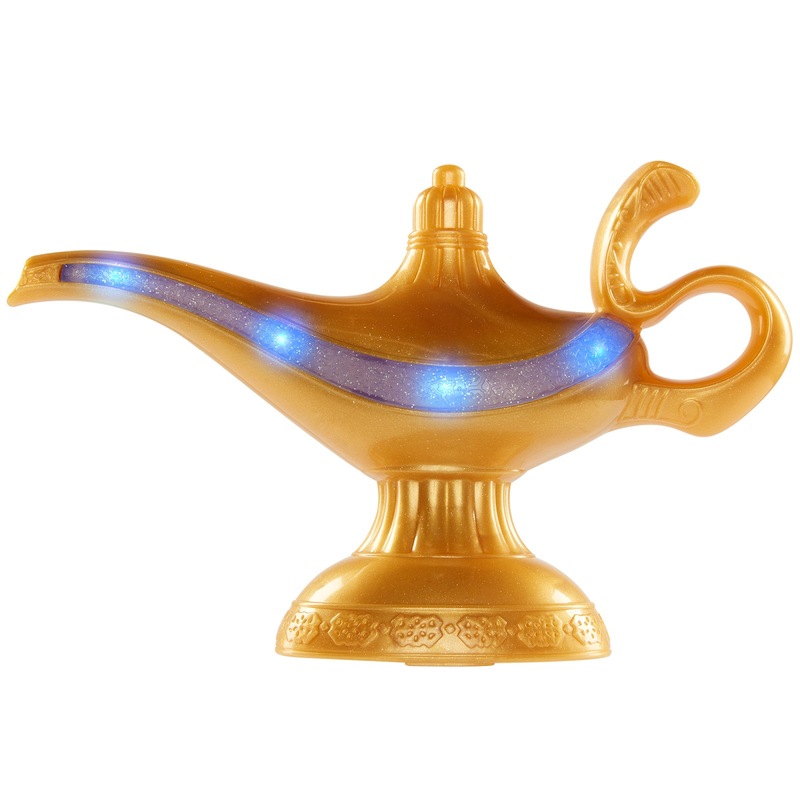 It's so cool to hear Will Smith's voice come through as the Genie in this totally cool toy! Jakks-Pacific’s costume line is glorious! 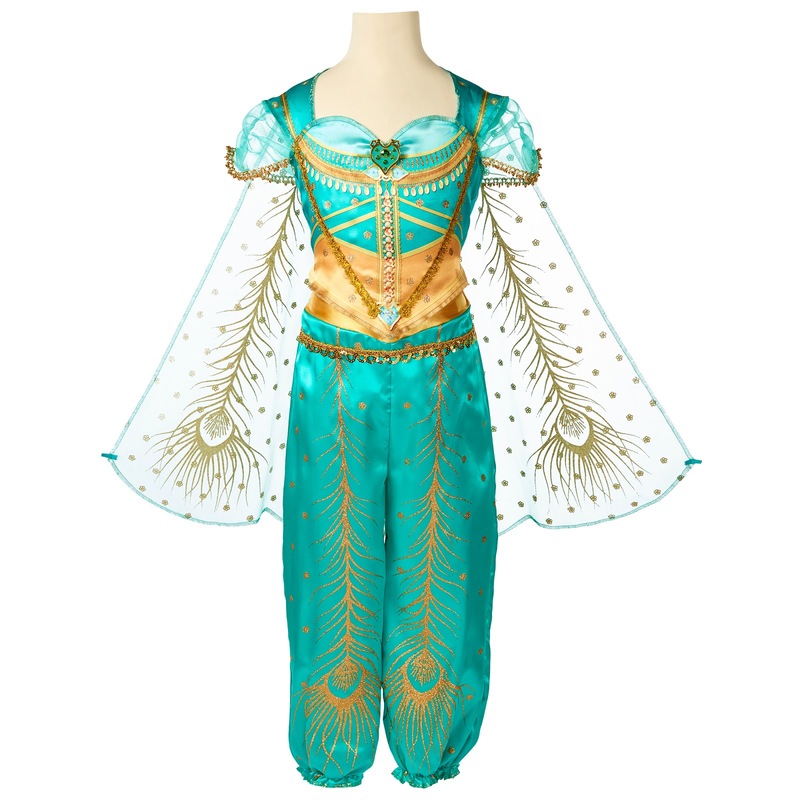 Inspired by costumes from the film, the Princess Jasmine outfits will give your kiddo the ultimate film experience from head to toe. 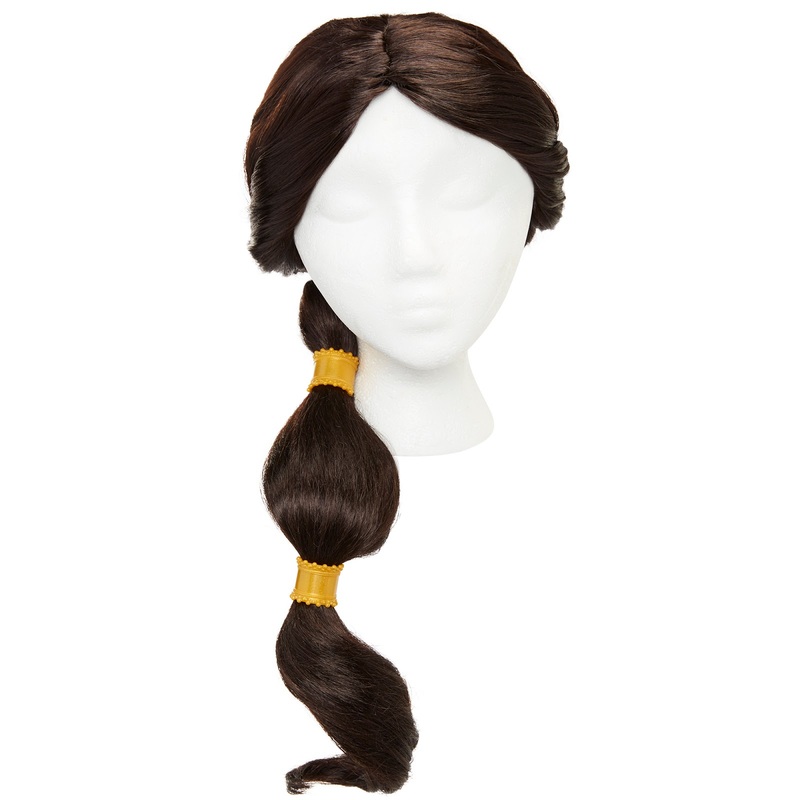 Start the magical transformation with Princess Jasmine’s wig, the wig is a film-inspired hairstyle worn by Princess Jasmine. 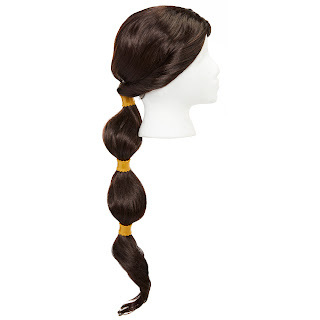 The wig is a long flowing hairstyle and has three removable hair clips. 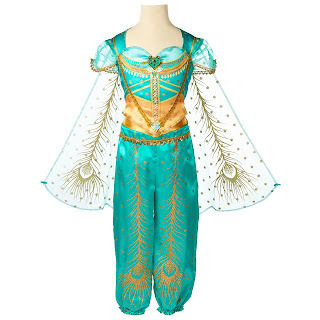 The “Whole New World” outfit can be found in the classic teal-blue, harem style outfit with golden appliqués, peacock feather elements, and an attached cape. Relive that magical moment by pulling out a special carpet to sing the song from that iconic scene! 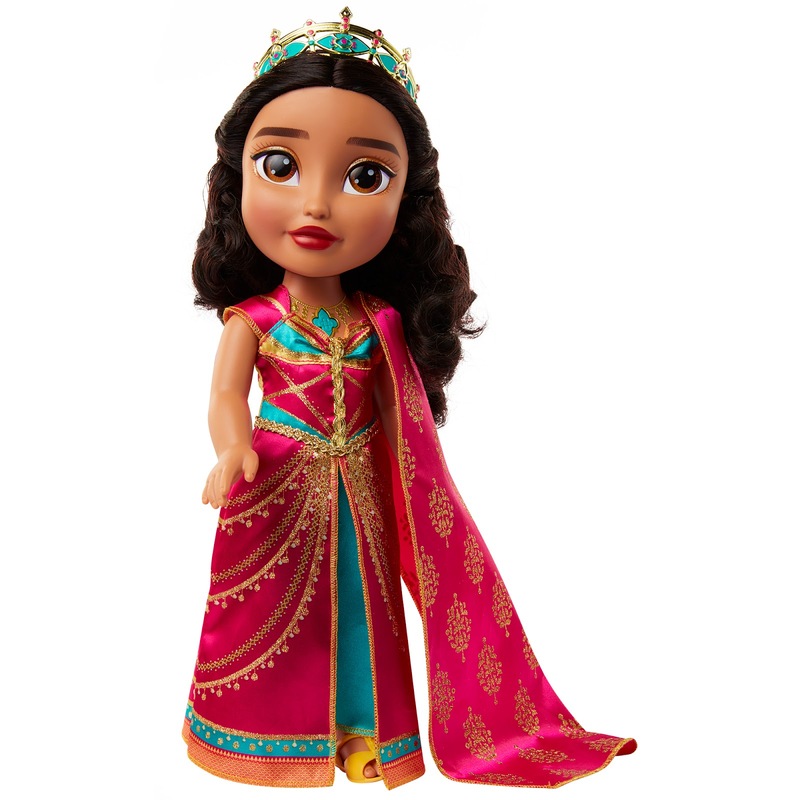 The Princess Jasmine fuschia/red dress is new dress for the film, that can also be found on the Princess Jasmine doll is one of regal quality. With printed fabric, golden accents will give your little one the feel of a real Princess. 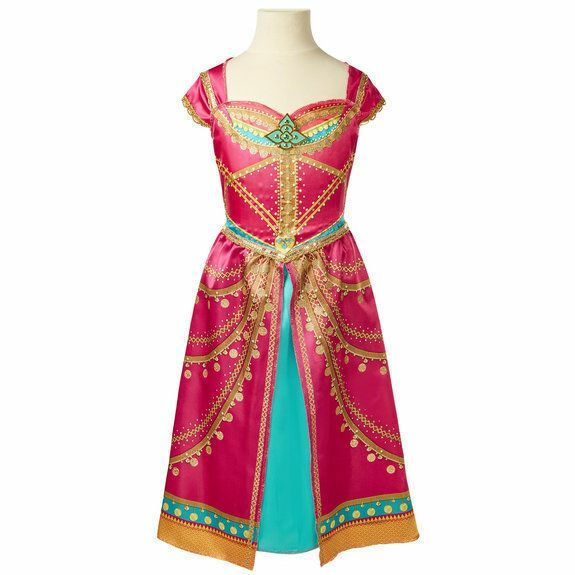 Pair this outfit with the Princess Jasmine Musical doll to recreate movie moments! Finally, no dress up outfit is complete without the accessories. 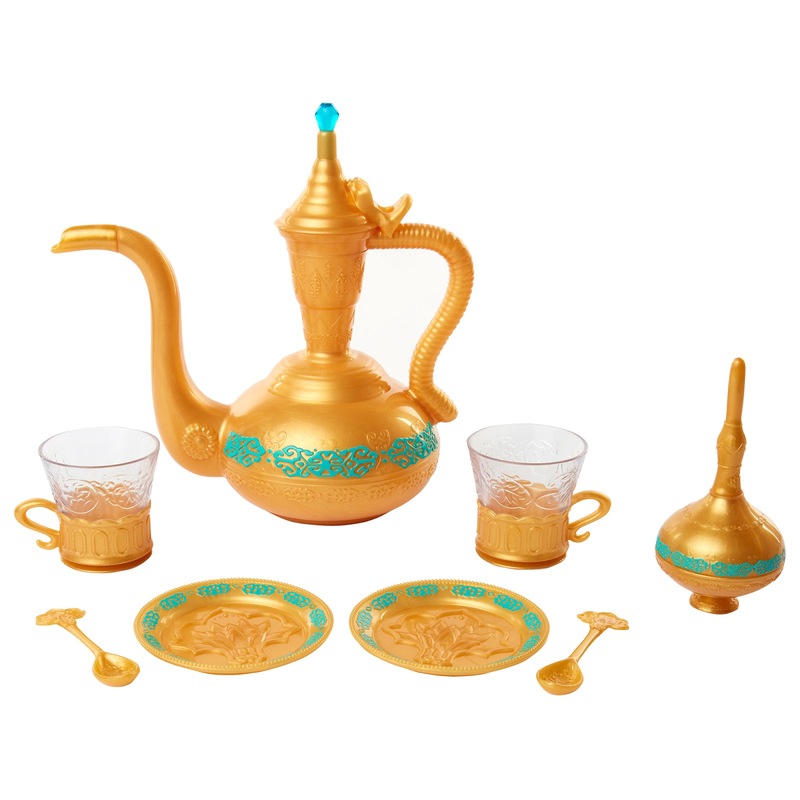 The Jasmine Royal Accessory Set is a deluxe six-piece set that is designed to match the “A Whole New World” outfit with its golden and teal tones. The deluxe set includes a tiara, a pair of shoes, a cuff bracelet, and a pair of earrings. Outfits $29.99, 3+. Wig, $19.99, 3+. Deluxe Accessories Set, $19.99, 3+. Spawning a whole session of pretend play, PRICELESS! Settle down for a cup of tea with the Agrabah Tea Set as this tea set is literally inspired by the magical city of Agrabah. You have the sultan’s palace as the teapot with lift up lid, a genie bottle sugar bowl with lid, two clear cups, fancy gold saucers, and golden spoons. This nine-piece set will give your kiddo plenty of pretend play! You can even fill the cups with real water to give it a more realistic experience. Make sure the water is cold, though! Startup playtime by purchasing this set now for just $19.99. Kids ages three and up will enjoy sipping on tea and talking of the magical qualities of the mythical city of Agrabah. Finally, end the day of magic by putting this adorable “A Whole New World” Jewelry box on your little one's nightstand and listen to the iconic song from this amazing film. Add a touch of royalty to this moment by wearing the included ring. 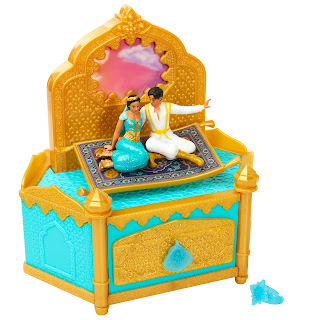 The jewelry box features the moment when Aladdin and Jasmine went on a magic carpet ride. For just $24.99, experience a whole new world of play with this iconic piece. I am honestly getting teary-eyed with this post! Big thank you to JAKKS-Pacific for sharing this first look with us! Be sure to check out our unboxing video, and subscribe to our YouTube channel for more Aladdin-inspired toy unboxing videos and skits using these amazing toys by JAKKS-Pacific.